Nearly all of us would like less stress in our lives, a better ability to focus, improved health, and a fitness routine that we truly enjoy. You may be surprised to learn that yoga provides all of these benefits with a system of exercises that can be adapted to any age or level of fitness. Today, millions of people practice yoga, from young to old, from the hyper-athletic to those dealing with chronic diseases. Based on extensive studies, yoga is recognized as one of the most effective activities for achieving a healthy mind and body. Yoga's many poses and exercises make it endlessly interesting and emotionally rich, giving you a wealth of options for designing a practice that fits your needs. Isn't it time to get started - not just learning about yoga, but doing it? 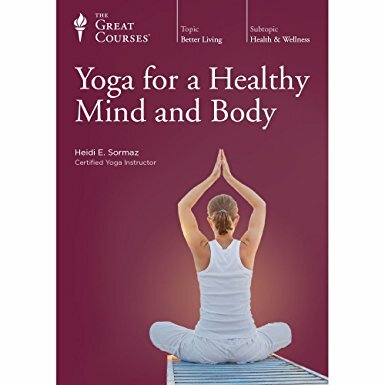 The 12 half-hour lectures of Yoga for a Healthy Mind and Body, taught by acclaimed yoga teacher Dr. Heidi Sormaz, are the ideal first step for a newcomer and a fascinating journey of discovery for those who already practice. After covering the history of yoga and its physiological effects, Dr. Sormaz takes you through a diverse set of routines, introducing the basics of hatha yoga along with the more specialized practices of Iyengar yoga, power yoga, yin yoga, Anusara yoga, and Forrest yoga. If you think, "I'm not flexible enough to do yoga," you should try this course. Dr. Sormaz shows that there is a practice that will work for you and help you on your road to a healthier mind and body.